Tonight’s challenge requires not just skill in identifying insects, but knowledge about where they occur. Some of these insects were photographed in California. Some of them were not. To earn Myrmecos points, tell me which ones are the real Californians (5 points – you have to get them all, with no errors) and the families to which they belong (5 points). 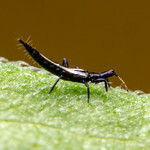 The cumulative points winner across all mysteries for the month of August will win their choice of 1) any 8×10-sized print from my insect photography galleries, or 2) a guest post here on Myrmecos. C) Got me here. Looks like a Carabid. No idea about distribution. 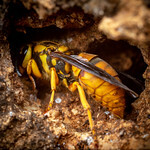 E) Sphecius speciosus. Eastern U.S.
F) Formica pallidefulva group. Just for kicks, F. pallidefulva itself (no actual idea about specific identity). Southeastern U.S.
G) Morpho pleides. Neotropics, at least Central America. Yes, I concede, I don’t know enough specifics here, but I’m giving it my best shot! Ok, sorry, I just want to clean up my typos: I meant Raphidioptera and Morpho peleides. I won’t push my luck with guesses for the other letters (or with more specifics). My bad! : Sphecius is in the Crabronidae and is not Californian! Damn! Hahaha! Too late even for one point. A) Termitidae. Don’t think these nasutes are Californians. C) Tenebrionidae. just going to guess that it is a Californian to even out the balance! D) Tabanidae(?) going to guess not CA. the guesses aren’t complete shots in the dark. . that beetle looks awfully familiar, and I don’t recall there being any tabanids (if it is) with long proboscides poking into flowers around here either. I thought I’d give it a try – B and C are from California. a) Termitidae (Nasutitermes), South and Central America. b) Raphidiidae, California. c) Tenebrionidae, California. d) Nemestrinidae, Africa. e) Sphecidae, Eastern US. f) Formicidae (Formica pallidefulva), Eastern US (Florida). g) Nymphalidae (Morpho pleides), South and Central America (Belize?). I am resubmitting because I made a mistake in C. Now it should be correct (hopefully). a) Termitidae (Nasutitermes), South and Central America. b) Raphidiidae, California. c) Amphizoidae (Amphizoa insolens), California. d) Nemestrinidae, Africa. e) Sphecidae, Eastern US. f) Formicidae (Formica pallidefulva), Eastern US (Florida). g) Nymphalidae (Morpho pleides), South and Central America (Belize?). a) Termitidae (Nasutitermes), South and Central America. b) Raphidiidae, California. c) Amphizoidae (Amphizoa insolens), California. d) Nemestrinidae, Africa. e) Crabronidae, Eastern US. f) Formicidae (Formica pallidefulva), Eastern US (Florida). g) Nymphalidae (Morpho pleides), South and Central America (Belize). Sorry for the comments diarrhea.